"People say music can't change the world. I think it can. Big Country were responsible for changing the face of guitar rock in the early 80s. This Scottish foursome crept onto the music scene in 1982 with a uniquely persuasive rock-anthem guitar sound, combing undercurrents of new wave with an Indo-jazz fusion input by ex-Skids Stuart Adamson and Bruce Watson. As a teenager, Stuart Adamson was a keen follower of new wave punk bands The Damned, Clash, Buzzcocks, The Slits, Subway Sect and The Jam. These were the influences which persuaded the young Adamson to start a band, not that he needed much persuasion. His ad in the local paper read: NEW WAVE BAND LOOKING FOR DRUMMER. NO HIPPIES. Out of this unobtrusive advertisment in the province of Dunfermline The Skids were born and Adamson's unique guitar-style became the musical focus. Support gigs for The Stranglers and Buzzcocks ensured imminent success. Sandy Muir, a record shop owner put up money for a demo single which John Peel couldn't get enough of. Jean-Jacques Burnell sorted out more gigs, while Peel did his bit by recommending his new-found sound to Virgin who immediately signed them up. In the days pre Skids, as a fifteen-year-old apprentice, Adamson was strumming R&B music in a Dunfermline-based covers group, Tattoo. He remembers the Skids days fondly, as a mixture of chaotic gigs and a right good laugh. He says later, of Big Country, "I was trying to recapture the feeling I had for the music in the early days with the Skids". These were the wonder years - filled with a passionate exhuberance and an innocent sense of what was yet to come. Hopes for a duo studio ensemble with fellow Skid, Bruce Watson were quickly discarded and two former members of On The Air (a support of early Skids performances) stepped in - Mark Brzezicki and Tony Butler - who brought with them the prestigious credits of The Pretenders and Pete Townshend. Ian Grant, a young manager, first saw Adamson when The Skids were supporting The Stranglers in '79. When Grant quit managing The Stranglers, he knew what he wanted next. Grant had seen Butler play with Pete Townshend at Brockwell park and liked what he saw. The band were put together, did four demos and got a record deal ten days later. Stuart Adamson (born 11th April 1958, manchester: vocals/guitar). Bruce Watson (born 11th March 1961, Timmis (sic), Ontario, Canada: guitar), Mark Brzezicki (born 21st June 1957, Slough: drums) and Tony Butler (born 2nd Feb. 1957: bass) each brought their own style and musical history to the new project which would mould the Big Country sound. Brzezicki harboured a passion for jazz and drumming (an unusual combination indeed), Butler had spent his youth playing guitar in front of the mirror (didn't we all) to the sounds of early Genisis and Hendrix, while Watson wanted to be either a footballer or a guitarist when he grew up. When he was 15, he gave up football. As a melodic punk group, Big Country had a fair amount of success but not a commercial scale. Then came the Alice Cooper tour, on which the lads lasted about two dates before the erratic Cooper changed his mind about his favoured support and threw them out. The band drew upon their multi-musical past and evolved into a remarkable fusion of country, folk and celtic blues, denying any preconceived formula for guitar rock of the 80s. They have since become one of the UK's greatest guitar bands in an age when digital synthesisers and secondhand pop was on the increase. Their first gig was in the Glen (Dunfermline). The lads have always maintained a healthy attitude to the music business. With Phonogram backing them and successful gigs and tours on the go it would have been easy to let it go to their heads. Butler says their aim was "to be a good group in a world where groups weren't particularly good". They hated the star system which housed arrogant pop stars and sought to make the system play the game their way - giving them all the rewards which success has to offer but without the trappings of fame, loss of privacy, freedom and time. Who could blame them? At the peak of their success however, Big Country seemed to vanish from the scene altogether. Rumours circulated that Stuart had had enough and quit. Even a U.S. tour, supporting Hall & Oates, wan't enough to deter the overworked Admason from wanting a break. A three year period of non-stop touring and a two-month soundtrack recording for 'Restless Natives' had taken their toll. this was to be their only new material in 1985. it wasn't until 1986 when Bob Geldof asked them to appear in the finale of Live Aid when the lads got back together. A UK tour was planned for the same year and so, after a much-deserved 18-month break, Big Country released The Seer (1986, Mercury), containing additional vocals by kate Bush, 'Look Away' was a major hit in 1986 reaching No.7. Peace In Our Time (1988) was released on a new label, Reprise, and saw a move in a totally new direction for the foursome. Utilising American production values, the old Big Country sound was given the stateside sheen. Leaving the bitter taste of mellow rock in the mouth. A move which Adamson later acknowledged as being "at a tangent to the plot". No Place Like Home was released in 1991 and finally saw the lads getting back to basics but adding their own Scottish sheen on an album of intense, uplifting tunes. Or as Adamson put it, "We're trying to do traditional things in a contemporary style". With Brzezicki as session drummer, the old recogniseable form of Big Country's leaping rock was gone. An alternative set of rhythmic patterns were used, creating a new sound. they had crafted one of the most distinctive sounds of British Rock. The album contained classic Country: 'Ships' and 'Into The Fire', but the boys were dissapointed with their new sound and signed with Chrysalis for '93's Buffalo Skinners - a return to form. In 1994 and 8-track Radio Sessions album was released and the following year, the BBC Live In Concert special featured 'Peace In Our Time', 'River Of Hope' and 'Kings Of Emotion' (sic). 1996's Eclectic recording at Dingwalls in London's Camden town featured guest vocalists Kym mazelle, Carol Laula and Steve Harley, belting out hits 'I'm on Fire', 'Ruby Tuesday' and 'The Night They Drove Old Dixie Down'. 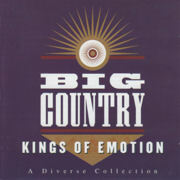 only last year the Big Country sound once again proved its worth with Brighton Rock - recorded live at the Brighton Dome in 1995 - the album is a pleasant seaside romp through favourites 'Thunder And Lightning', 'God's Great Mistake', 'You Dreamer', 'Sail Into Nothing', 'I'm Not Ashamed' and 'Post Nuclear Talking Blues'. Contrary to what we'd expect when we think of Big Country, it's not all guitar, guitar, guitar. A mixture of 12-string guitars, mandolins, sitars, banjos and honky tonk pianos all go into producing the celtic-country swing which lends itself to both uncomplicated vocal/piano duos and belting instrumentals. Big Country share the same traits that helped make U2 so universally popular. Both groups are 'outsiders' in that they don't come from London, New York or Paris and have never pretended to. They harness that which made them unique in the first place and don't ever lose sight of it. Ever since they formed, fifteen years ago people have attributed Big Country with their very own musical culture - a neatly packaged marketing niche - in the category of 'Scottish Rock'. Yes, some of them may be from Scotland but Big Country are more than four lads from the provinces making good music. Without letting sentimentality get in their way, they produce fine, rousing anthems and ballads, shouting, whispering individual stories with different settings and a new set of emotions each time. They tell tales of hidden treasures and magic and paint pictures of weather-beaten hills and stormy skies. Of The Crossing, Adamson once said, "The sound made pictures. It spread out wide landscapes. great drums were played out under turbulent skies. there was romance and reality, truth and dare." Adamson's heart has always belonged to the serene pastures of his adopted hometown of Dunfermline. With several depatures from the usic scene throughout the years, Adamson found it difficult to cope with the day to day pressures of success. Big Country are classic anti-rock stars of their time. Despite playing on the Grammies show in the U.S., flying on Concorde, having top ten albums, hit singles and gold discs, Adamson, Watson, Butler and Brzezicki have remained four wholesome boys. Adamson sees himself as a working person, though working class isn't something he believes in. "Putting divisions between people which shouldn't be there." Richard Jobson (ex-Skids) said of Big Country's success, "They captured emotions most people overlook or take for granted and created a vehicle for release for many people." These boys are here to stay. No matter what new sounds are on offer - drum n' bass, jungle, techno - there's always a place in our hearts for Big Country. Stuart Adamson : vocals/guitar) . Tracks 9-16 Issued under licence from Castle Copyrights Ltd.